We provide a complimentary thorough walk-around of your RV with ANY RV purchase at the time of delivery. During this Educational Orientation we will ensure you know how to use your RV by covering each switch, feature, and all maintenance and warranty items. Eve and Larry from Pason, AZ bought their Winnebago Revel from a large dealer with locations in Arizona, Florida, New Mexico and California. However, they felt the orientation they received was inadequate and the dealership representative providing the orientation didn't know very much about the RV they were purchasing. So they traveled all the way to Lichtsinn RV in Iowa to get their questions answered by Lichtsinn RV's Ben Follman, RVIA/RVDA Certified Technician. Lichtsinn RV is America's closest RV dealer to the Winnebago Motorhome factory, located just 1 mile from it in Forest City, Iowa. 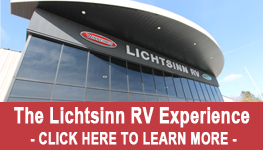 Lichtsinn RV specializes in Winnebago Motorhome products. All of Lichtsinn RV's Sales Consultants, Service Advisors and RV Technicians are factory trained by Winnebago Industries. See reviews from guests throughout the Country who have chosen Lichtsinn RV for their Motorhome purchase here. Learn more about our half day educational orientations here.